How can I write better? How can my blog be more attractive for my readers? Those are the questions that all bloggers have. You can waste an entire day writing a post that only a few people would read, or you can craft an engaging publication in a matter of hours. Like every other blogger, you certainly aim for the second alternative. Luckily, there are great blogging tools that will boost your effectiveness. In addition to commitment and talent, you also need to rely on the right online resources to achieve your ultimate level of productivity. Continue reading to discover the best blogging tools you should try in 2016. Before you start crafting new content for your blog, it is good to check how your overall site is performing. Once you get general impressions, it will be easy for you to take the right direction with the upcoming publications. Quick Sprout enables you to enter a URL and get a detailed analysis of the performance and content of the particular site. You will not only get a detailed analysis of your site’s performance, but you will also get tips on search engine optimization, social media marketing, content marketing, link building, email marketing, paid advertising, conversion optimization, and reputation management. You will also get a report, which will warn you if your heading tags are being too short or too long, and it will show you where you are missing out on using keywords. You will get useful suggestions that call for immediate action, so you will quickly make improvements to your site. This is also a great tool for analyzing your competition. If you notice that your competitors get a better SEO score than your site, that is the aspect you should improve to attract more visitors your way. You have to become aware of the problems your target audience faces if you want to develop a successful blog. Instead of writing on random topics, you can get inspired by real questions that will undoubtedly attract a great number of readers. Quora is getting more popular than ever. It is the best destination for people who want to get their questions answered by experts. Your Quora feed is full of questions in categories you are interested in. Get inspired by these dilemmas and respond to some of them through insightful blog posts. Short but sweet, Rand’s bio allows him to put emphasis on the Moz, which links to the homepage. Start answering questions. You are an expert in your niche, so you have much knowledge to share. These people have questions you can answer, and that is how you become part of the community. 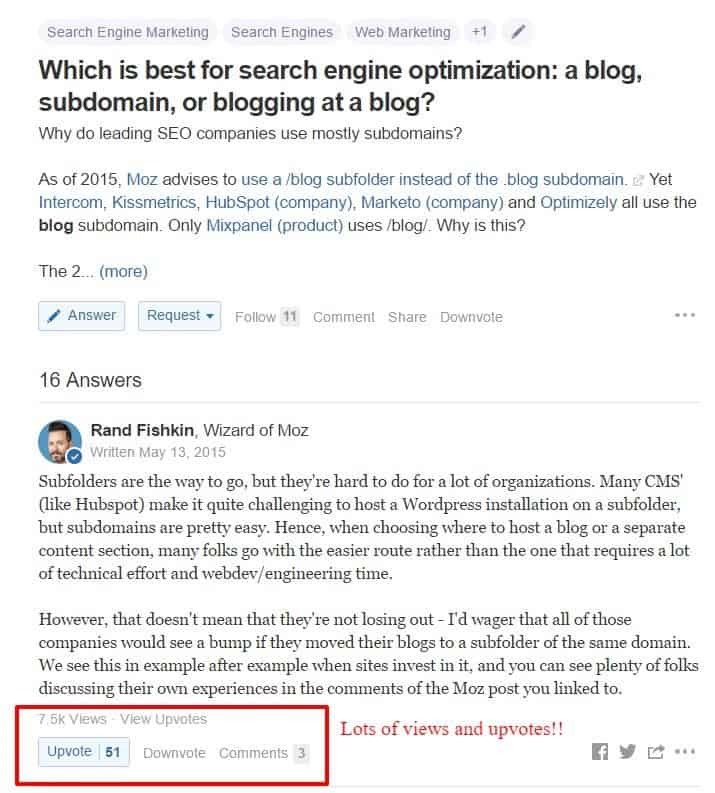 Insightful answers on Quora will lead to long-term traffic to your blog. If you want to be a successful and productive blogger, you need to take small steps towards that goal. Wunderlist is a great app that helps you track all tasks you have in mind. It is really motivational since it sends reminders for upcoming activities. Include research, writing, and marketing in your daily routine! This task should be in your Wunderlist every single day. Organize a daily plan that will help you make blogging part of your life. If for example, you plan to publish a new post in six days, today’s plan can include part of the research process. Tomorrow, you will create the outline, and you will start writing the day after that. You will tackle some marketing every day. That is how blogging will become a daily routine, and you will not perceive it as a burden. You need to plan the publication dates of your posts. If you intend to attract regular readers towards your blog, you have to maintain a routine. They will return to see new content on the scheduled date, so you better deliver what you promised. You do not need to pay for a fancy calendar app when Google gives you all you need for free! Since you get multiple ideas for posts and you cannot cover them all in a single week, you can organize them for later publication. Create events in the calendar and move them around to create the perfect schedule. You can zoom into the schedule to see your plans for a particular day. Editor’s note: As a blogger, the most important function of Google Calendar is the ability to help you build an editorial calendar. By scheduling your posts in advance, you can help your blog produce content on a consistent basis. For more information on how you can do this, please refer to this post at Hubspot. This tool will show whether or not you have been smart with the way you use the Internet. Are you wasting huge chunks of your day on Facebook and Twitter? Use Toggl to get a real impression of how committed you are to the blog. All you need to do is push the Start button, and you will get detailed information on the time you spent on different activities. You can also access a report of all the hours you logged in using the tool. The data should serve as a wake-up call to how productive you have been with work. You think you are spending only 10 minutes on Reddit, but 10 minutes in various parts of the day may add up to 2 hours. Locate the websites that distract you the most. Try to reduce the time you spend on them, day by day. So how do you use all that time you save? On blogging, duh! There is hardly a better tool you can use for organizing your ideas. Trello enables you to collect information and organize it in a flexible and visual way. When you discover an inspirational blog post or online article, only add it to your Trello board, and you will see it as a card. You can drag and drop the cards to make the board more organized, so you will get a better idea for the development of your next projects. Create a different Trello board for each idea you get. When you are about to start writing a new blog post, and you are not sure what topic to tackle, go through the boards, and you will surely find something interesting. You can make your Trello board private, but you can also share it with collaborators. Editor’s note: I consider Trello to be my tool of choice for helping me write faster. I can organize the different writing projects I am managing at the moment so I can prioritize the tasks that need my attention. More importantly, Trello helps me build outlines for each of my posts so I can jut focus on writing the content later on. It is important to keep up with your schedule and deliver content on trending topics. You already have Google Calendar as a tool that supports that process. However, sometimes you cannot complete a brilliant post on the right topic at the right time, so you need assistance if you want to meet the expectations of the readers. Assignment Masters enables you to collaborate with professional researchers, writers and editors, who will help you boost the overall quality of your blog. When you get stuck, fill in the form at the site and ask for personalized assistance. You will get to work with an author who holds a degree in your niche. Collaborate with the writer to get exactly what you need. Different online platforms block distractions and enable you to work in a simple writing environment. However, you will save much time if you just rely on the WordPress Distraction Free Writing feature, since you will write and format the content in a single step. No copy-pasting and handling the post in different programs! Turn Distraction Free Writing mode on, and WordPress will hide everything that would distract you from the process of writing. You will see an almost blank page with a minimal toolbar that works impeccably. It seems like people will never get bored of memes. Visual content is relevant when you want to grab the attention of your readers, but you cannot achieve that effect with a random image you download from the web. A meme will be much productive regarding getting shares and comments. Meme Generator is a great tool that enables you to attract the audience. Select an existing character and create your meme with it. You can pick a quote from your blog post (if it is fun enough to go with a meme), or you can get inspired by the meme itself. The important thing to keep in mind is your niche. You can put the meme in the blog post and make it shareable. Alternatively, you can simply share your version of it on social media so that you will attract users to the fan page. Why would you pay for images when you can get the visual content of similar quality for free? Dead to Stock is an excellent service that provides free pictures of good quality. Subscribe to this service, and you will get regular email messages that inform you about the new additions to the collection. You will mostly find lifestyle photos, so this service is awesome if your niche fits in that category. Sometimes you feel like you are spending too much time on your content and you never get the expected outcome. You must be doing something wrong. Productivity is not only about the efforts you invest in a project; it is about the results they deliver. The ten tools listed above will help you discover a whole new dimension of blogging in 2016. Try them out and share your experience! Kate Simpson – head of editing team at Assignment Masters. Kate is also contributing her own insights at news column.